Wisdom teeth can wreak havoc in your mouth if you don’t have room for their growth. One of the most frequent complications after removing wisdom teeth is infection. The decision on whether to have your wisdom teeth removed or not is often debated. But if your wisdom teeth are crowding, or have the potential to crowd, the other teeth in your mouth, almost every dentist will tell you that they should be removed. If they aren’t removed, the pressure may begin to misalign the other teeth, which can result in myriad dental problems. According to LiveScience.com, our ancestors probably used their wisdom teeth (we don’t). These early people needed all the chewing power they could get to eat the coarse food in their diets. In addition, without proper dental care, our ancestors lost permanent teeth at young ages due to tooth decay or periodontal disease. The wisdom teeth, sitting farther back in the mouth, could then come into play to help with the chewing. Although our foods are far softer today, some experts believe that if your jaw is large enough to support those four wisdom teeth—and not crowd the other teeth—and they don’t cause you no pain, removing wisdom teeth has no purpose. In 2017, oral surgeon Hossein Ghaeminia, of Radboud University Nijmegen Medical Centre in the Netherlends, weighed the risk of complications when removing wisdom teeth to not removing them, reports Science Daily. That said, according to JeanBrownResearch.com, 85 percent of us have them removed. That’s 10 million wisdom teeth every year. It’s largely considered a preventative maneuver to avoid bigger problems as the person gets older. Note: If you’re one of the 15 percent minority who choose to keep your wisdom teeth, you should discipline yourself to practice pristine oral hygiene, including brushing, flossing, and dental rinses, to reduce the risk of problems. Why Are They “Wisdom Teeth”? Wisdom teeth are the third molars. There are normally four of them: two on the top jaw (one on each side, farthest in the back) and one on each side of the lower jar, again, farthest back. Including the wisdom teeth, we have 32 teeth. The wisdom teeth are the last to develop in our mouths, usually between the ages of 17 and 22. The third molars are commonly called “wisdom teeth” because they appear “at an age where people are presumably ‘wiser’ than as a child, when the other teeth erupt,” says Wikipedia. Although the process of wisdom teeth erupting through the gums may cause you to emphasize with infants going through teething (it hurts! ), impacted wisdom teeth are no picnic either. Impacted teeth are stuck in the gums, unable to erupt because they are blocked by other teeth or are growing sideways within the gum. Although the surgeon will have to cut through the gum to get to the unerupted wisdom teeth, if surgery is not done, these wacky-growing wisdom teeth can disrupt other permanent teeth. The pressure can also cause cysts and tumors (usually benign, or non-cancerous). 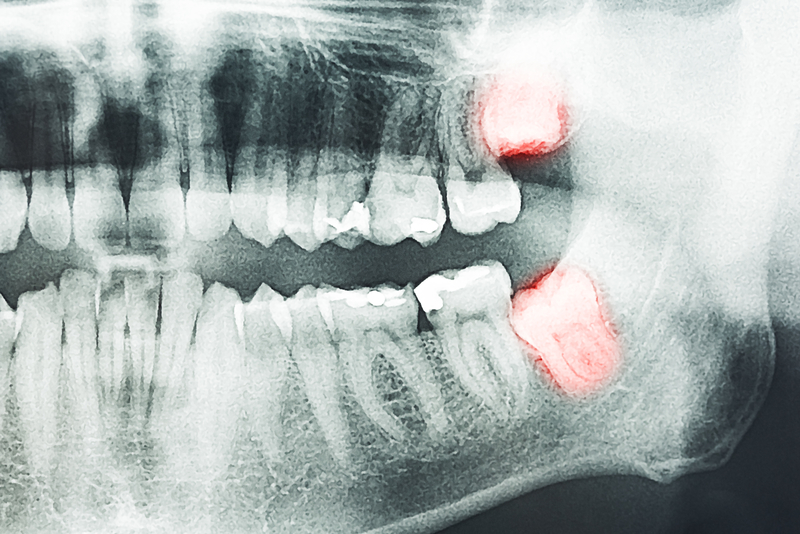 Worse yet, unerupted wisdom teeth may begin to destroy the jaw bone structure. Partially erupted teeth are big problems, causing pits for plaque build-up and pockets for food debris. This can lead to decay problems, periodontal issues, and infection. As you get into your late teens, your dentist will watch the development of your wisdom teeth through X-rays. If it appears that you should have your wisdom teeth removed because they are likely to cause problems, the sooner this surgery is done, the better. The longer wisdom teeth remain in your mouth, the more attached they become to the bone and the more difficult they are to remove. Usually, an oral surgeon will remove your wisdom teeth, although a few general dentists still perform the procedure. You will likely be under anesthesia during the procedure. After initially trying to loosen any visible wisdom teeth, the surgeon cuts into the gums to begin the process of removing the wisdom teeth. Often, the wisdom teeth are cut into smaller pieces for easier removal. The surgery itself is not painful, but you may be uncomfortable for three days, on average, after having your wisdom teeth removed. It is not a minor procedure, and some people have felt uncomfortable for two weeks following the surgery. The surgeon puts sutures in your gum where the teeth were removed, and swelling is to be expected. bacteria, bone, dangers, dangers of tooth infection, dental insurance for seniors, food, gingivitis, health, infection, inflammation, pain, reduce inflammation, smoking, tooth pain, veneers.